With panoramic views over the River Thames, Thai Square Putney Bridge is situated in the award winning building of Putney Bridge with an interior designed to create a contemporary Thai theme. With awards from the Royal Institute of Architecture, the American Institute of Architecture and Wandsworth Corporation, this is one of the most uniquely styled buildings in London. The exterior of this building resembles a ship with metal beams and tall glazed windows allow diners stunning views across the river. Within this ultra modern building, the interior has been redesigned by the new proprietor using many antique Thai artefacts. These include 8 Buddhas who look impassively and as tradition dictates are fed and watered daily. A design of white waves flow over the walls of the sweeping staircase which led from the reception to the first floor dining area. Behind the elegant ground floor bar the nautical theme is further extended using ropes threaded through timber panels. The bar overlooks the point at which the annual University Boat Race starts and features a full length balcony where guests can sit and relax at the water edge. There is an extensive bar menu, or should you prefer a full dining menu. A wide an extensive range of drinks is available for your enjoyment including Champagnes, cocktails, wines, beers and fruit juices. 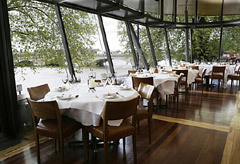 A large room separated from the main body of the bar by sheet glass etched with designs by David Collins offering privacy and relaxation with direct river views. A large selection of some of the finest cigars is available for your enjoyment. This area can also be reserved for private parties and functions by prior arrangements. The dishes are rich and complex with exotic herbs blended with essential ingredients freshly flown in daily from Thailand. The menu is extensive with lots of pan-fried dishes, curries, soups, salads and vegetarian options.